John Tefteller's Blues Images 2019 Blues Calendar, Volume 16, is STILL Shipping!! 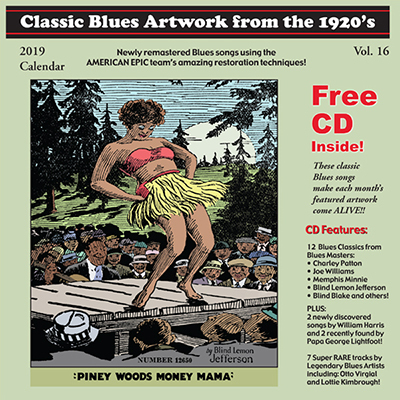 Get your 2019 Classic Blues Artwork Calendar with 23-track FREE CD, remastered with the SPECTACULAR American Epic method! You'll hear the BEST sounding songs we've ever had! Charley Patton, Joe Williams, Blind lemon Jefferson, Blind Blake, Memphis Minnie and many more have NEVER sounded better! And we are now accepting PayPal! 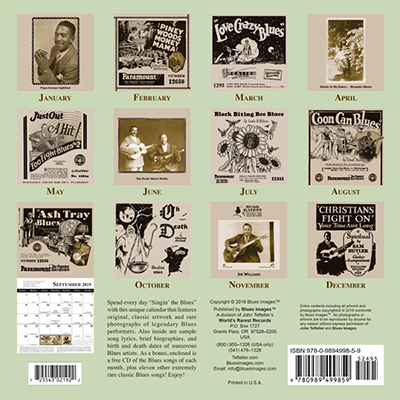 HOME • BLUES CALENDAR • BLUES CD's • BLUES POSTERS • BLUES T-SHIRTS • MUSEUM RECORDS! Yazoo's CD Set "The Return Of The Stuff That Dreams Are Made Of!" Only $22.95! American Epic Sound Restoration Team! We Also Accept PayPal Now! You Will LOVE THE NEW SOUND! Hear these 23 tracks as you’ve never heard them before! 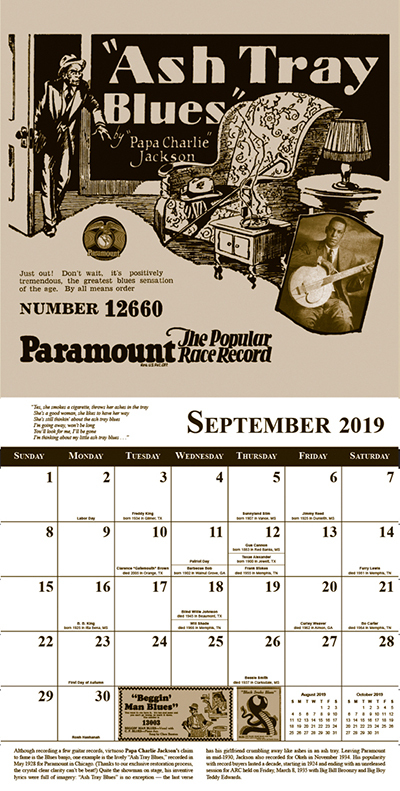 Get your 2019 Blues Artwork Calendar with Free CD! Charley Patton, William Harris, Blind Lemon Jefferson, Blind Blake, Memphis Minnie, Raymond Barrow, The Beale Street Sheiks, Lottie Kimbrough and more!! Plus two RECENTLY DISCOVERED tracks by Papa George Lightfoot! Email Blues Images • Phone (800) 955-1326 (USA Only) or (541) 659-7175 (USA Cell Phone) or (541) 476-1326 (Outside the USA) • Write us at P.O. Box 1727 Grants Pass, OR 97528-0200 • Order all our items directly and securely using Authorize.net's Secure Ordering Site • All images are copyrighted and watermarked and are not to be used without my express permission.